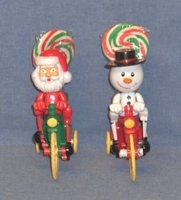 These Santa And Snowmen Biker Buddy Christmas Candy Is Just The Perfect Addition To Anyone's Present Or Stocking. Each Novelty Candy Comes With Christmas Lollipop style of sucker varies per manufacturer. Remove The Suckers, Wind Up The Bike And Watch Them Go. Due To Product Availability We Choose The Either The Santa Or Snowman. Quanties are Limited.